I'm in love with the Albums Made Easy system. 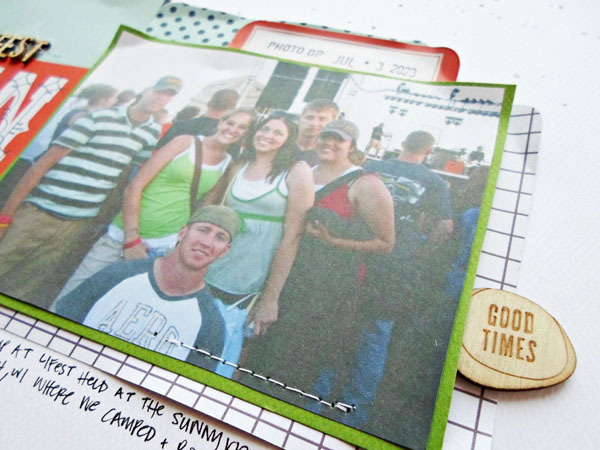 With the different page protectors and journaling cards, it's easy to create a unique album. 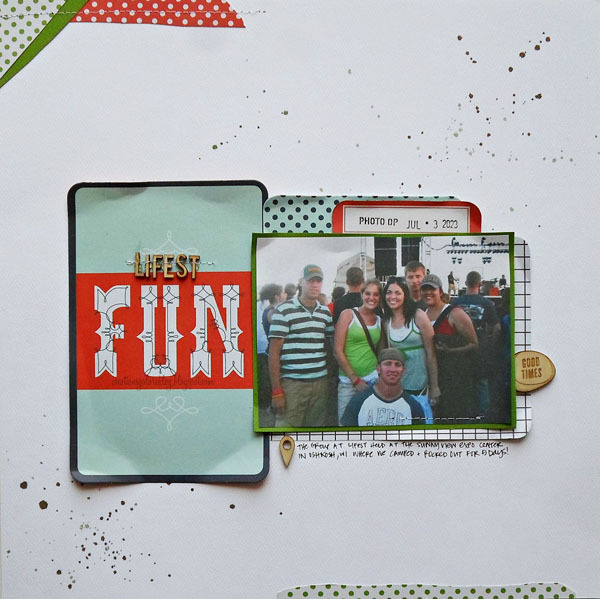 I enjoy mixing traditional layouts with the page protectors and have put together a few samples for you today. I hope you'll find inspiration to simplify your own record keeping! In college, a group of my friends and I would travel to a summer music festival held in July every year. For about 6 years in a row, we camped out for 5 days and rocked our faces off. To document our first year at the festival, I created a traditional layout with a group picture. I used several of the Albums Made Easy journaling cards from the Memo collection on the layout. In fact, the green cardstock matting the photo and the 12x12 white cardstock are the only papers that are not journaling cards! It was easy to layer them onto the page. I even cut the date tab off the top of one card and used the remainder of it for the red strip in the top left corner. The paper triangle in the same spot and the strip on the bottom right corner are a cut up 4x6 journaling card as well. 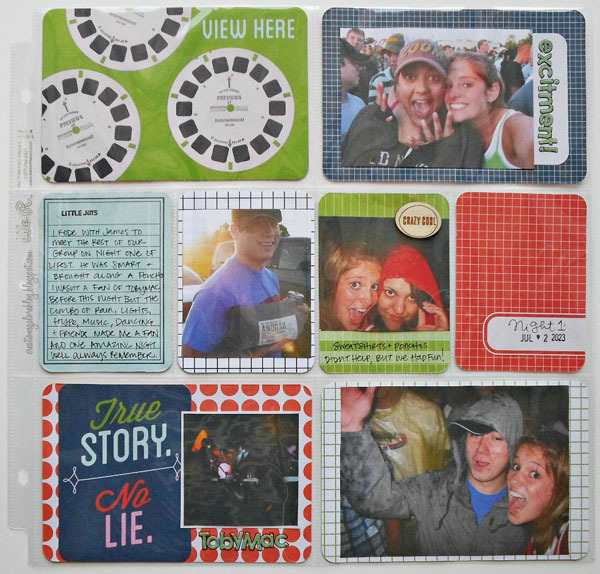 After the traditional layout, I chose to use the We R Memory Keepers photo sleeves to document the individual days. I plan to use one side for each day. 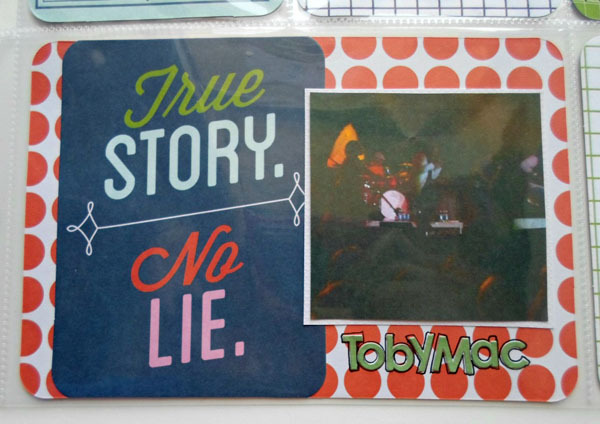 This sleeve documents the first day, which actually was only tent setup and a night concert. This year I arrived late and missed the set up (no pictures). But it rained and rained and rained. It was fun to finally document these memories in a fun way. I never scrapped these photos, because I wasn't sure how I wanted to document so many pictures from 5 days of events! This really helped me break up the different parts of the day. I have several "titles" and journaling spots. Each pocket has potential to be a mini layout with a new idea, but keeping it in the same color scheme helps unify the entire spread. With their pre-made "kits" (I used Memo), the guess work of color and patterns is eliminated! Spot a weird date? Sorry! I always date my sample layouts that hang in the store with a future year. I can't get enough of the American Crafts date stamps. Get your hands on one, or two, or fourteen. But date your layouts properly! I tried to keep the embellishments simple, deciding to add a single Studio Calico wood veneer and a few BasicGrey sticker letters. 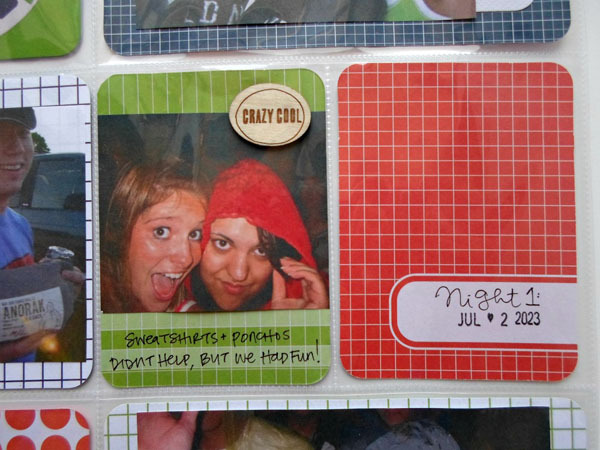 For this project, you really only NEED photos and a journaling pen. If you choose to make your photos a little smaller than the pockets (like I have) add adhesive to your list. Easy as can be! And fast too! Thanks Nicole! Interested in learning more techniques and tricks using the Albums Made Easy System? We invite you to attend one of my upcoming classes. 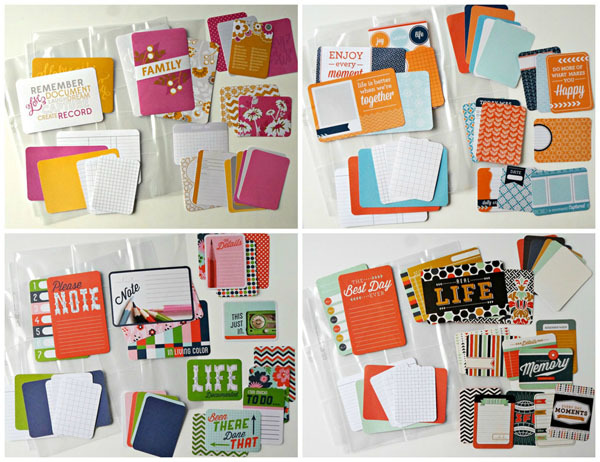 Included in the class is a great kit full of cards, paper, and page protectors to help you get started! Sign up today!